Monday, Sept. 5, 2016: Oakland, Calif. It had been too long since I’ve seen an A’s game. 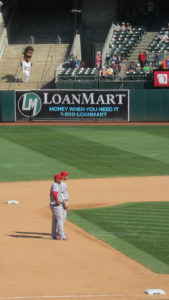 Admittedly, Billy Beane and Lew Wolff have done their best to discourage anyone from keeping up with the A’s, but that never-ending roster reshuffle and a .423 winning percentage resulted the availability of a nice seat near third base for a mere $20 on StubHub, so there I was. 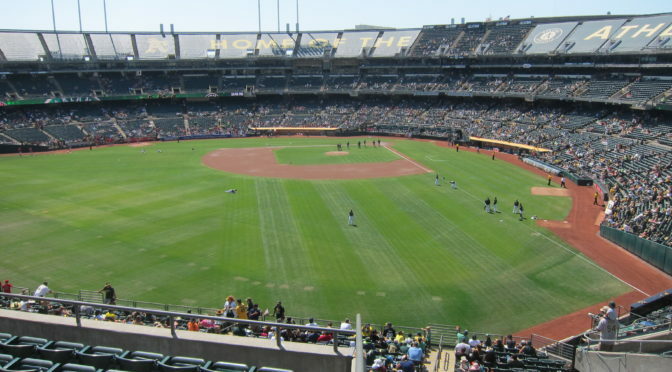 The Coliseum experience remains what it has long been — the place is less than ideal for baseball — though the presence of gridiron lines on the field let me know my seat would have been excellent for football as well. But the fans are great, their passion and timing more than making up for their relatively small numbers, an announced 18,149 on Labor Day against a team that was equally disappointing this year. 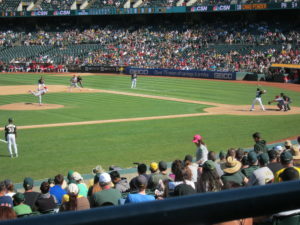 A Latino Nuke LaLoosh: It was the major-league debut for A’s pitcher Raul Alacantara, who marked the occasion by hitting three batters in the first, on his way to giving up five run in two innings that also featured a home run and a run-scoring balk. No where to go but up. His shaky start helped put the A’s down 8-2 after the top of the third, but give them credit for fighting back to get to within 8-7, stranding 11 runners in the process. No excuse: After all the recent trades, Stephen Vogt is the only name I recognized on the roster, but I should have known about Khris Davis, who entered the game with 34 home runs and added a 35th in the seventh. New and Maybe Improved: Since my last trip to the Coliseum, they’ve either put in new scoreboards or gave them a software update, delivering high resolution through what tech critics would call a crowded, confusing UI. Game recap here and boxscore here.